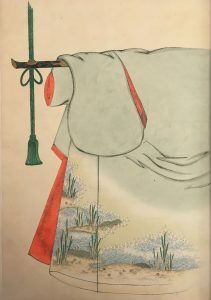 Moyō no Hon. Source: University of British Columbia. Library. Rare Books and Special Collections. Asian Rare-6 no.L1. The book bears no publication information, suggesting that it is an unicum created for a small circle of designers and clients. 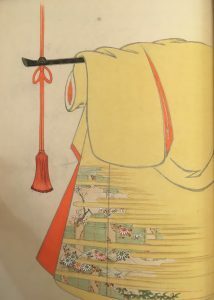 Based on comparison with similar pattern books from the Meiji period 明治時代 (1868–1912), the item can tentatively be dated to the turn of the century. 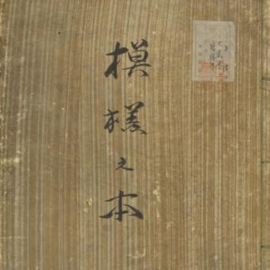 A bookplate states that it once belonged to an as-yet-unidentified Imao Collection—whose plate and seal (Imao zōsho 今尾蔵書) are registered in the ex-libris database compiled by the National Institute of Japanese Literature, but without attribution (Fig. 1). 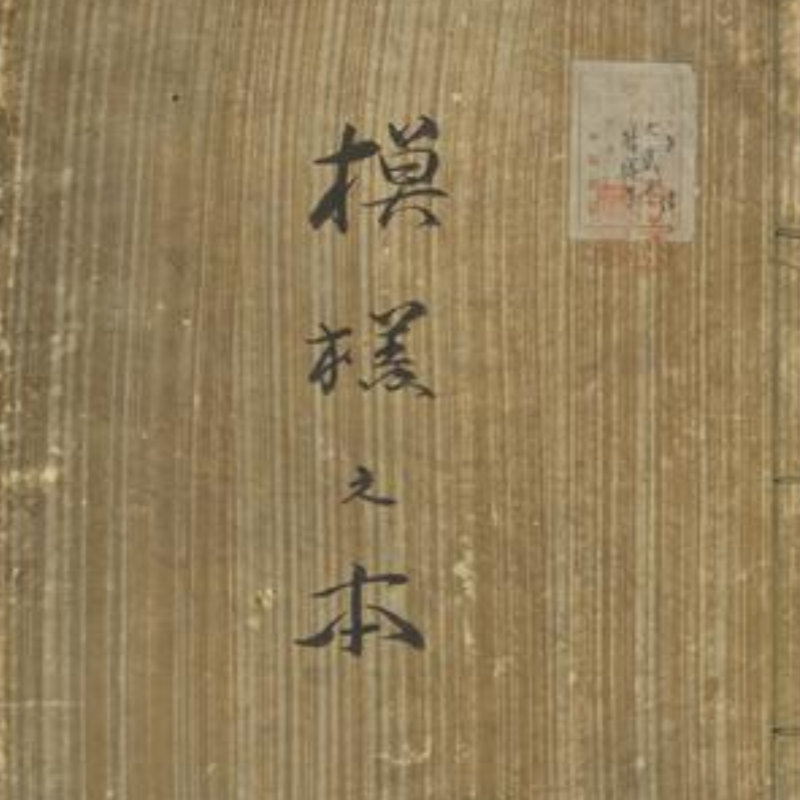 A sticker inside the back cover indicates that the book passed through the hands of the erstwhile Kyoto bookseller Yamamoto Bunkadō 山本文華堂 (Fig. 2). Fig. 1 – Front Cover Detail. Source: University of British Columbia. Library. Rare Books and Special Collections. Asian Rare-6 no.L1. Page 1 (Click to enlarge, or visit source here). Fig. 2 – Back Cover Verso Detail. Source: University of British Columbia. Library. Rare Books and Special Collections. Asian Rare-6 no.L1. Page 44 (Click to enlarge, or visit source here). Pattern books (called “hinagata bon 雛形本 [model books],” “hiinakata ひいなかた [models],” “ishō bon 意匠本 [design books],” “zuan chō 図案帖 [ideas-in-illustrations books],” etc.) like this one functioned in the past as fashion magazines and catalogs. Browsing through such books, clothing designers could concoct ideas for new patterns, while prospective customers could imagine what sort of kosode they might commission. 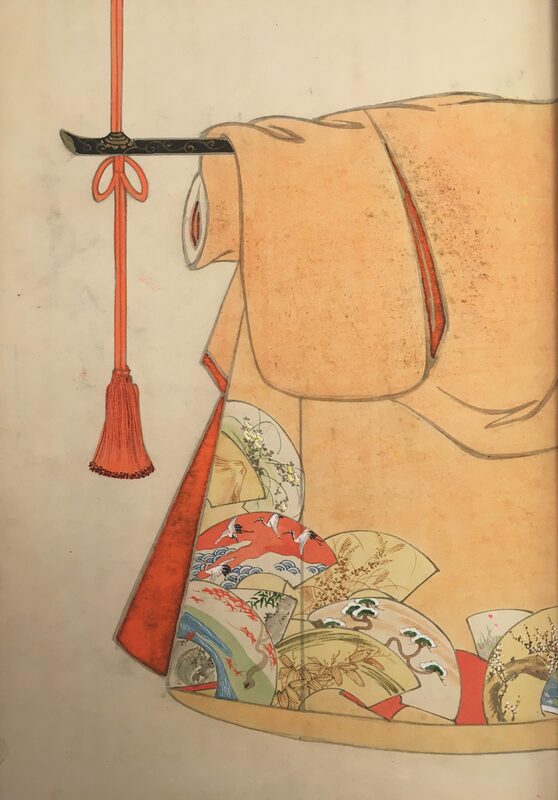 The Edo period 江戸時代 (1603–1868) was the heyday of pattern books. 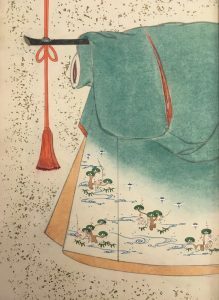 In the wake of Japan’s civil war, the seventeenth century saw the beginning of a long era of political stability. With this came an improvement of the social and economic infrastructure, which allowed the merchant class to flourish. It was during this period that the general population became cognizant of the concept of “fashion” and its concomitant commodities. Fabric sellers partnered with publishers to issue pattern books for circulation among potential clients from the warrior and merchant classes, and artists and designers launched their own clothing brands. Around 1800 the production of pattern books dipped for unknown reasons. But the Meiji period saw a resurgence in production. Thanks to the importation of new technologies (particularly synthetic dyes and techniques for their use) from the West that revived the textile and printing industries, pattern books once again circulated as sources of fashion inspiration. 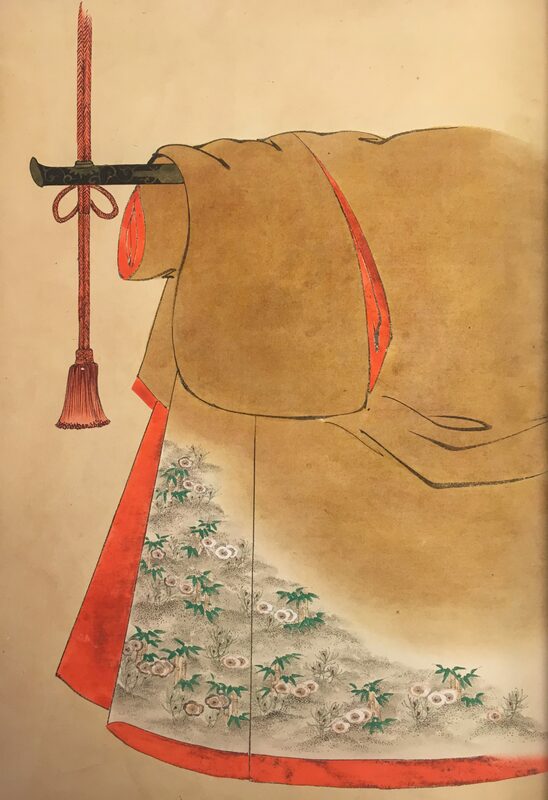 Handcrafted catalogs such as Moyō no hon, as well as the kimonos depicted within, were products of the newfound availability of such dyes. During the Meiji period, sericulture became one of the most profitable sectors of foreign trade for Japan. While much top-grade silk fabric was exported to Europe, there was an ample supply for domestic consumption by the wealthy. Silk kimonos were luxury items not available to women of all classes. Hence Moyō no hon provides a glimpse into the ways in which wealthy women might have enjoyed kimono fashion in the Meiji era. 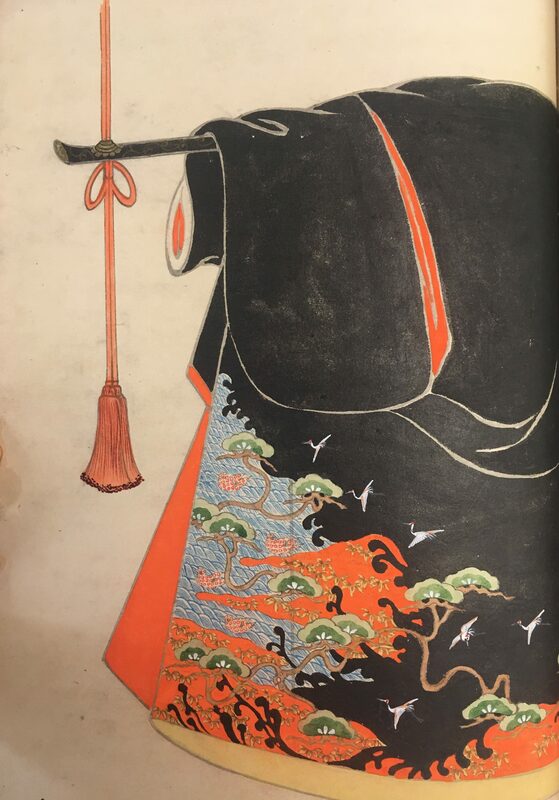 The style in which the tomesodes in this book are rendered is called “tagasode 誰が袖.” “Tagasode” literally means “Whose sleeve?”; and the word carries a romantic connotation that implies a longing for the owner of the kosode. The concept of tagasode is believed to have its origins in a literary motif from classical Japanese poetry. 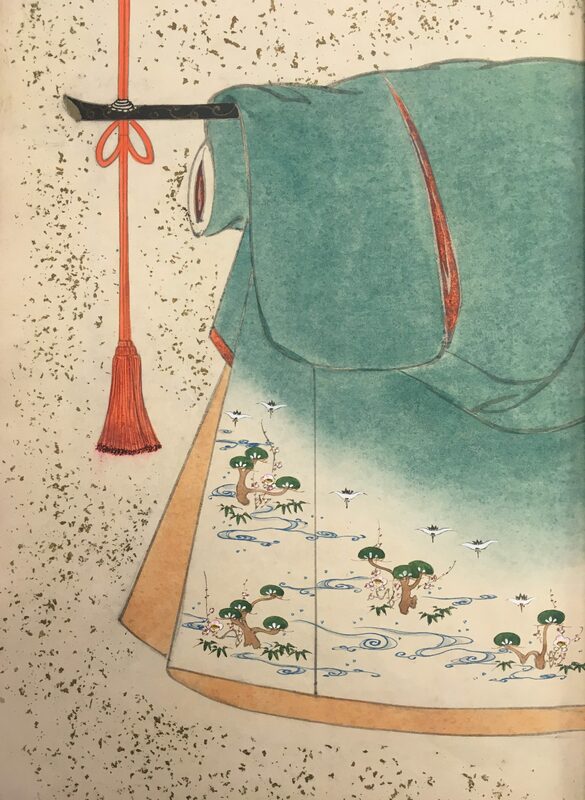 An anonymous poem in the Spring section of the famous poetry anthology Kokin wakashū 古今和歌集 [A collection of poems from ancient and modern Japan] (ca. 920) reads: “Iro yori mo ka koso aware to omouyure tagasode fureshi yado no ume zomo 色よりも香こそあはれと思ほゆれ誰が袖ふれし宿の梅ぞも [It is their fragrance rather than their color that affects me. 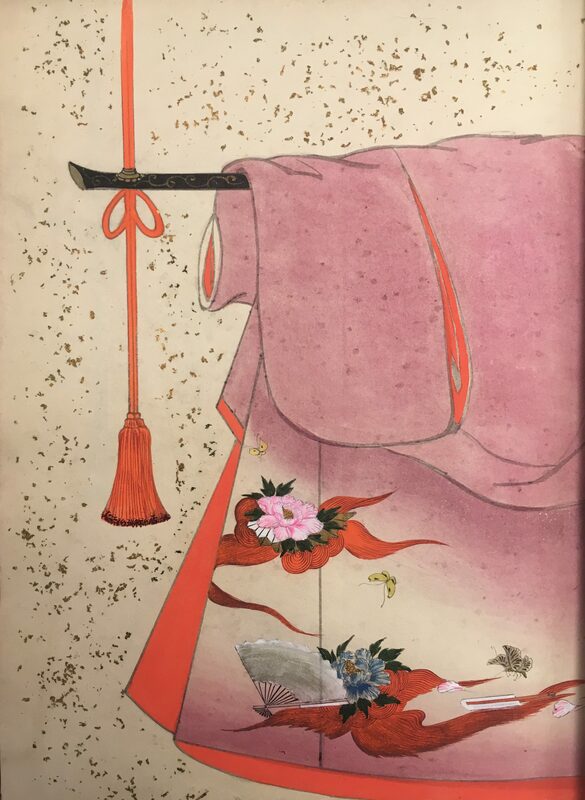 I wonder whose sleeve might brush against these plums to carry away their scent].” This evocative topos evolved into a popular aesthetic motif in the decorative arts, from screens to writing boxes (see examples at the Metropolitan Museum of Art). In such contexts kosodes are shown folded casually and hung on clothing stands. There even exist kosodes whose patterns show kosodes hung in this tagasode style. 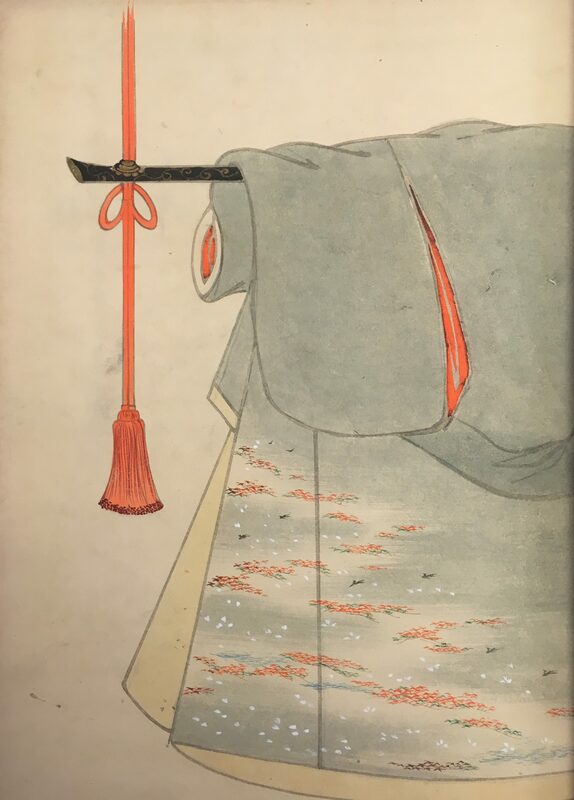 This way of hanging the kosode effectively reveals the lining, which is an important element of kimono fashion (see the vivid orange lining in Fig. 3-5). The color of the lining needs to complement the color of the outer fabric, whether through strong affinity or sharp contrast. 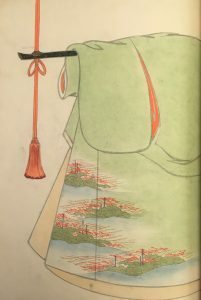 As such, the color of the lining says much about the kimono wearer’s taste. Fig. 3. Source: University of British Columbia. Library. Rare Books and Special Collections. Asian Rare-6 no.L1. Page 20 (Click to enlarge). Fig. 4. Source: University of British Columbia. Library. Rare Books and Special Collections. Asian Rare-6 no.L1. Page 22 (Click to enlarge). Fig. 5. Source: University of British Columbia. Library. Rare Books and Special Collections. Asian Rare-6 no.L1. Page 24 (Click to enlarge). Kimono pattern books that use this tagasode style to showcase patterns are not uncommon. 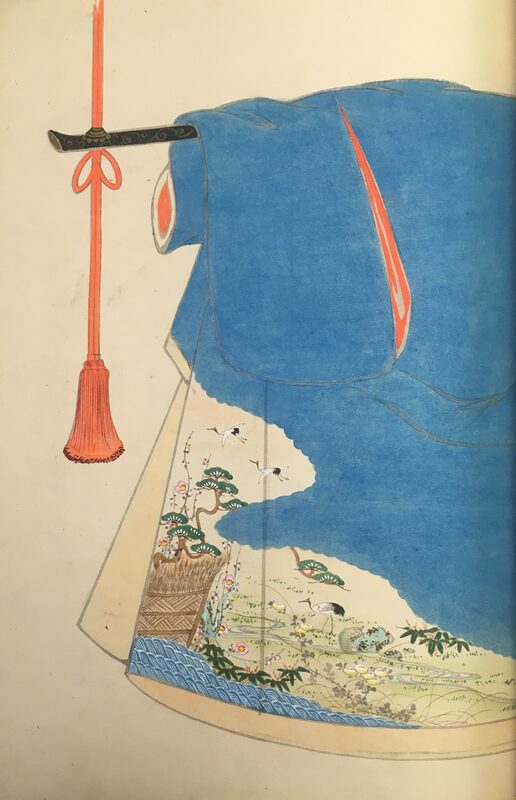 For instance, the first volume of Onna shorei shū 女諸礼集 [An anthology of manners and etiquette for women] (1660)—a guidebook for young women preparing for marriage—shows kosodes in the tagasode style to instruct readers in seasonally-appropriate patterns. 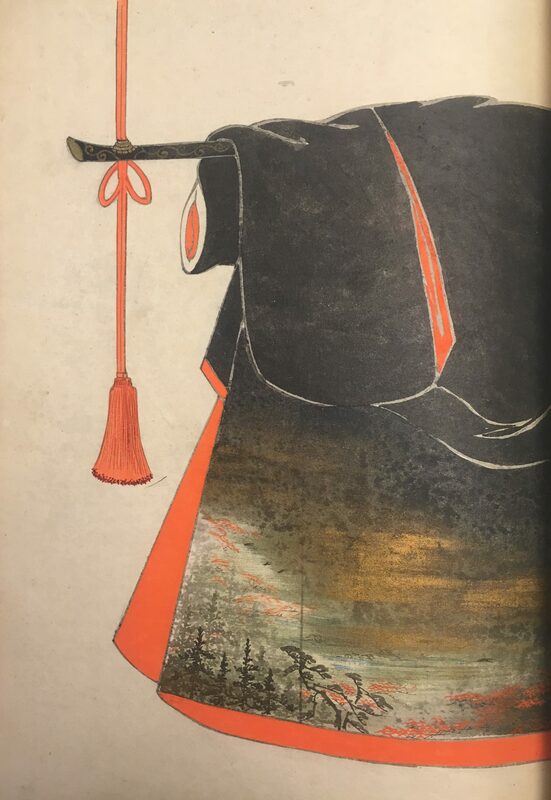 A more recent example is Jidai kosode hinagata byōbu 時代小袖雛形屏風 [A collection of kosode patterns from the past] (compiled in 1939 by Nomura Shōjirō 野村正治郎), a pictorial encyclopedia of kosodes from previous centuries. 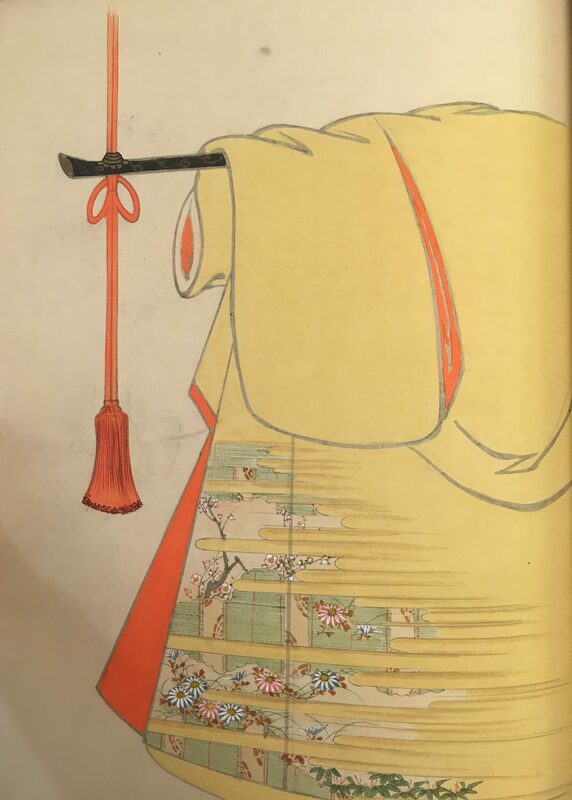 The tagasode style works well for the tomesodes in this pattern book, because tomesodes have patterns only below the torso; therefore, there is no need to show the sleeves or upper part. During the Meiji period the tomesode assumed its function as a formal garment for women to wear when attending celebratory events such as weddings, and it was thus common to feature auspicious symbols that contributed to the making of a congratulatory atmosphere. Most of these auspicious symbols (kisshō moyō 吉祥模様), though fully embedded in Japanese culture, derive ultimately from China—whence they were adopted during Japan’s first-millennium steps toward nation-building. Fig. 6 - Shō-chiku-bai 松竹梅 Motif. University of British Columbia. Library. Rare Books and Special Collections. Asian_Rare_06_no_L01_019_L. Page 2 (Click to enlarge). University of British Columbia. Library. Rare Books and Special Collections. Asian_Rare_06_no_L01_019_L. Page 4 (Click to enlarge). University of British Columbia. Library. Rare Books and Special Collections. Asian_Rare_06_no_L01_019_L. Page 20 (Click to enlarge). University of British Columbia. Library. Rare Books and Special Collections. Asian_Rare_06_no_L01_019_L. Page 26 (Click to enlarge). Shō-chiku-bai 松竹梅 [pine-bamboo-plum]: Known as the three friends of winter in Chinese culture, pine, bamboo, and plum symbolize perseverance and vitality because all three survive the harsh winter. This is one of the most common auspicious symbols in Japan, and the book contains four patterns that feature it (Fig. 6). Fig. 7 - Matsu 松 Motif. University of British Columbia. Library. Rare Books and Special Collections. Asian_Rare_06_no_L01_019_L. Page 6 (Click to enlarge). University of British Columbia. Library. Rare Books and Special Collections. Asian_Rare_06_no_L01_019_L. Page 28 (Click to enlarge). University of British Columbia. Library. Rare Books and Special Collections. Asian_Rare_06_no_L01_019_L. Page 32 (Click to enlarge). University of British Columbia. Library. Rare Books and Special Collections. Asian_Rare_06_no_L01_019_L. Page 42 (Click to enlarge). Matsu 松 [pine tree]: As an evergreen tree, the pine symbolizes vitality and strength (Fig. 7). Fig. 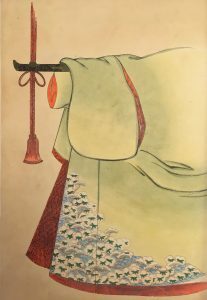 8 - Tanchō-zuru 丹頂鶴 Motif. 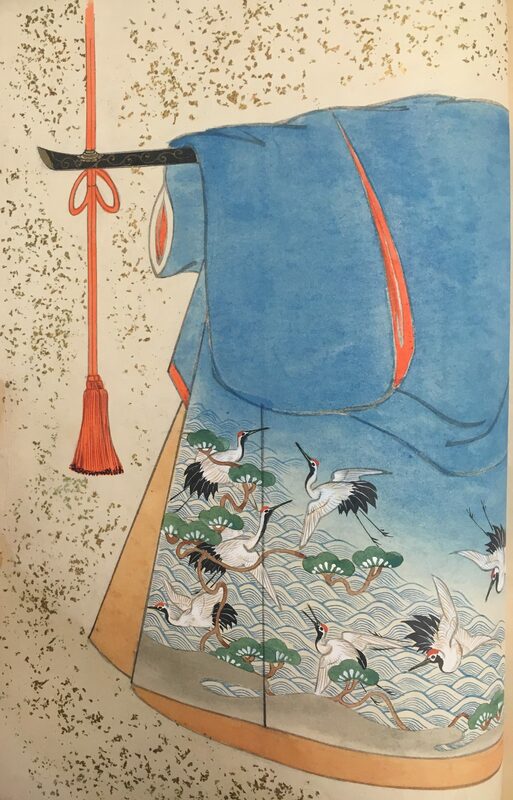 Tanchō-zuru 丹頂鶴 [red-crowned crane]: This particular type of crane symbolizes longevity in Chinese culture (an ancient Chinese text called Huainanzi 淮南子 [A collection of philosophies] records that they live a thousand years). The motif is often paired with other auspicious symbols (Fig. 8). Fig. 9 – Botan ni chō 牡丹に蝶 Motif. Source: University of British Columbia. Library. Rare Books and Special Collections. Asian Rare-6 no.L1. Page 14 (Click to enlarge). Botan ni chō 牡丹に蝶 [peony and butterfly]: The peony is considered the king of flowers in China because of its rich beauty and medicinal value (the root of the plant has long been used to treat convulsions). The flower also symbolizes elegance and sophistication. The butterfly symbolizes evolution, resurrection, and longevity, thanks to the transformations that it undergoes in the course of its life cycle. One pattern in the book exemplifies feminine elegance with peonies, butterflies, and a folding fan (a high-class motif due to its associations with court life) on soft pink fabric (Fig. 9). Fig. 10 – Nami chidori 波千鳥 Motif. University of British Columbia. Library. Rare Books and Special Collections. Asian Rare-6 no.L1. Page 16 (Click to enlarge). University of British Columbia. Library. Rare Books and Special Collections. Asian Rare-6 no.L1. Page 32 (Click to enlarge). Nami chidori 波千鳥 [waves and plovers]: Birds (often plovers) soaring in formation over the waves symbolize a couple’s bond to overcome obstacles in life. In one pattern the beach is dotted with clams suggestive of the couple’s inseparability (as each half of the bivalve has but one perfect match), making this tomesode especially suitable to be worn by a wedding guest (Fig. 10, Left). 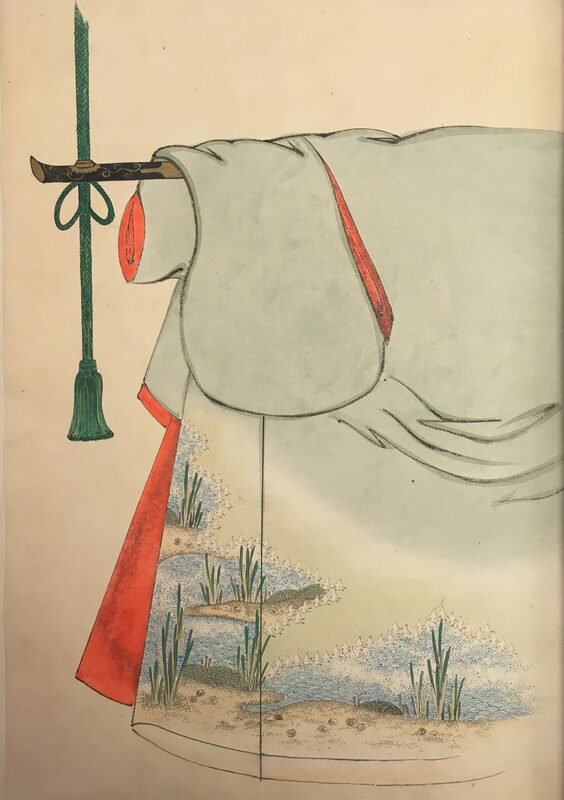 Another incorporates the pine-bamboo-plum and the crane into its design, wishing for a marital union as hardy as the plants and as long-lived as the crane (Fig. 10, Right). Fig. 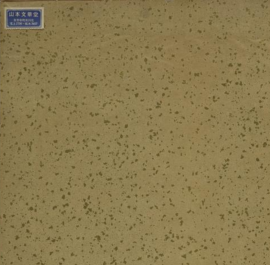 11 – Hagi 萩 Motif. Source: University of British Columbia. Library. Rare Books and Special Collections. Asian Rare-6 no.L1. Page 12 (Click to enlarge). Hagi 萩 [bush clover]: The hagi is one of the autumnal flowers that appear often in classical Japanese poetry. 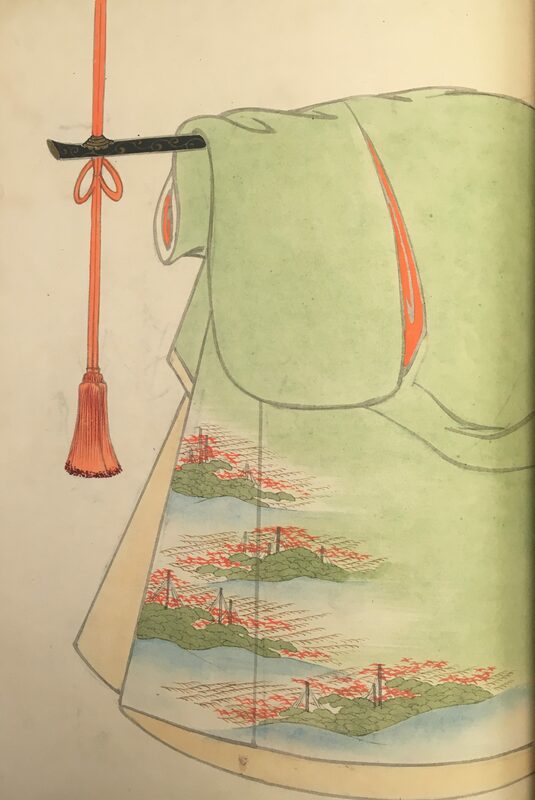 The design in the book also includes the nami chidori motif, which suggests that this tomesode would be suitable for wearing to an autumn wedding (Fig. 11). Fig. 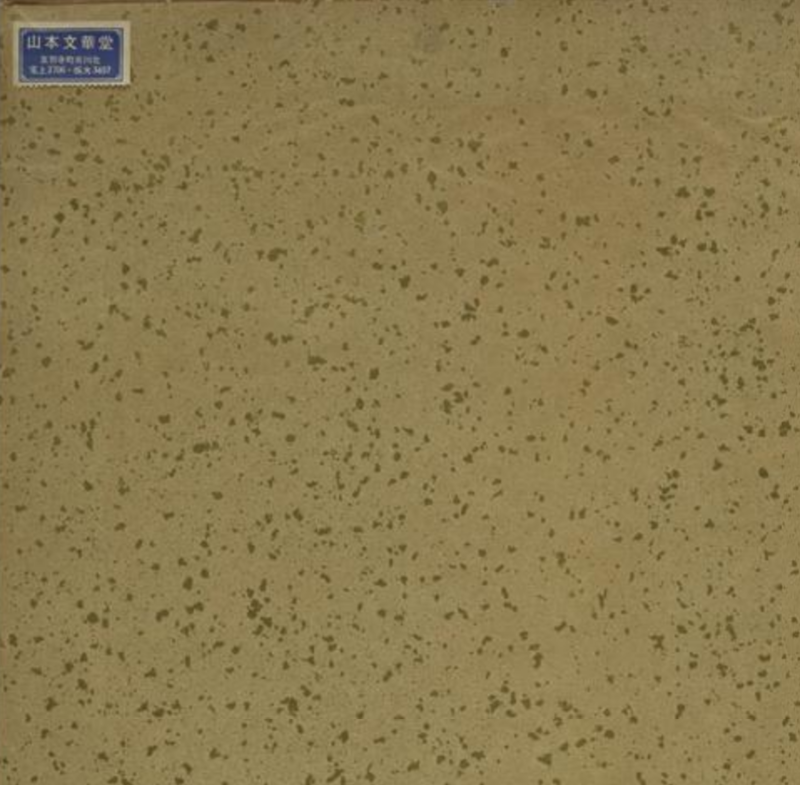 12 – Misu 御簾 Motif. Source: University of British Columbia. Library. Rare Books and Special Collections. Asian Rare-6 no.L1. Page 30 (Click to enlarge). 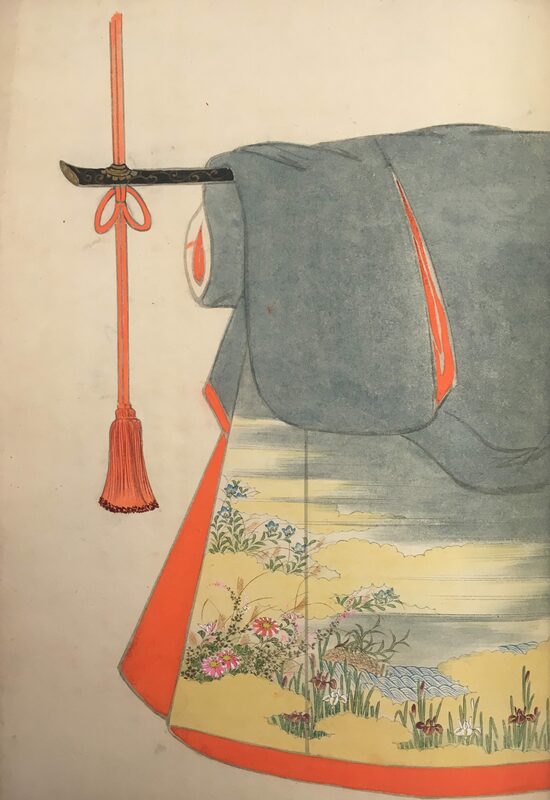 Misu 御簾 [royal screen]: The misu is a type of suspended blind used at for the sake of propriety at the royal court (for instance, to sequester the noblewomen, and to shield the nobles from the gaze of commoners in their employ). Due to its associations with court life, the motif as it appears on the formal garment exudes a sense of nobility and elegance. 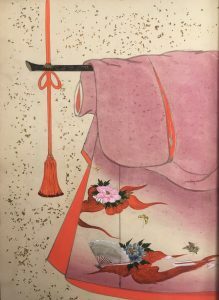 The pattern with the misu motif in the book has a design with plums and chrysanthemums partially obscured by a haze—an artistic gambit frequently used in paintings in pre-modern Japan (Fig. 12). Fig.13 - Seasonal Plants and Flowers Motif. University of British Columbia. Library. Rare Books and Special Collections. Asian_Rare_06_no_L01_019_L. Page 10 (Click to enlarge). University of British Columbia. Library. Rare Books and Special Collections. Asian_Rare_06_no_L01_019_L. Page 34 (Click to enlarge). University of British Columbia. Library. Rare Books and Special Collections. Asian_Rare_06_no_L01_019_L. Page 36 (Click to enlarge). University of British Columbia. Library. Rare Books and Special Collections. Asian_Rare_06_no_L01_019_L. Page 18 (Click to enlarge). Fig. 4. Source: University of British Columbia. Library. Rare Books and Special Collections. Asian_Rare_06_no_L01_019_L. Page 22 (Click to enlarge). Seasonal plants and flowers: An assemblage of plants and flowers can evoke a particular season. For example, the book includes a design with an autumn theme featuring Japanese silver grass and chrysanthemums (Page 10). Chrysanthemums and maple leaves are both evocative of autumn (Page 34; Page 36). Other designs fit multiple seasons. The combination of colored maple leaves and scattered cherry blossom petals with birds might be appropriate for attendees of autumn or spring weddings (Page 18). The combination of flowers from early summer (sweet flag) and autumn (bellflower, bush clover, Japanese silver grass, chrysanthemums) makes this design suitable for spring or autumn (Page 22). The sense and sensibility of seasonal motifs has always been very important in Japanese culture. 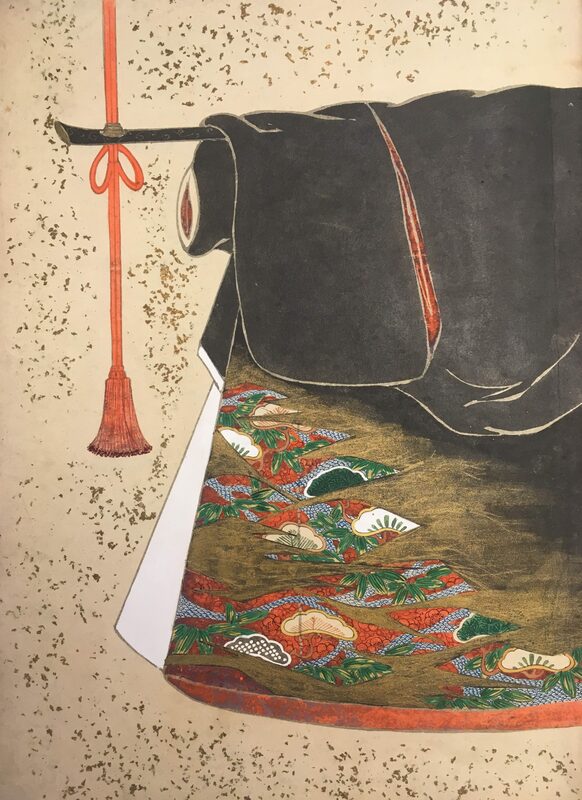 It is considered fashionable to wear a kimono with botanical motifs marking the coming season, while it is seen as uncouth to wear a kimono with seasonal patterns after that season has passed. Fig. 14 – Several motifs with Mt. Fuji. Source: University of British Columbia. Library. Rare Books and Special Collections. Asian Rare-6 no.L1. Page 8 (Click to enlarge). The most inclusive pattern in the book is the one with many of the aforementioned motifs alongside Mount Fuji (Fig. 14). Clothes communicate personality. 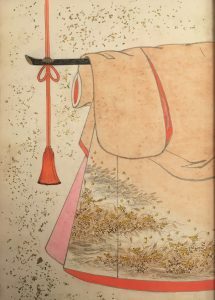 Discussion of kimono fashion often centers on casual kimonos, which ostensibly afford more freedom of expression. However, even within the limited realm of tomesodes (where formal dress codes may restrict one’s style), there is room for personal choice. 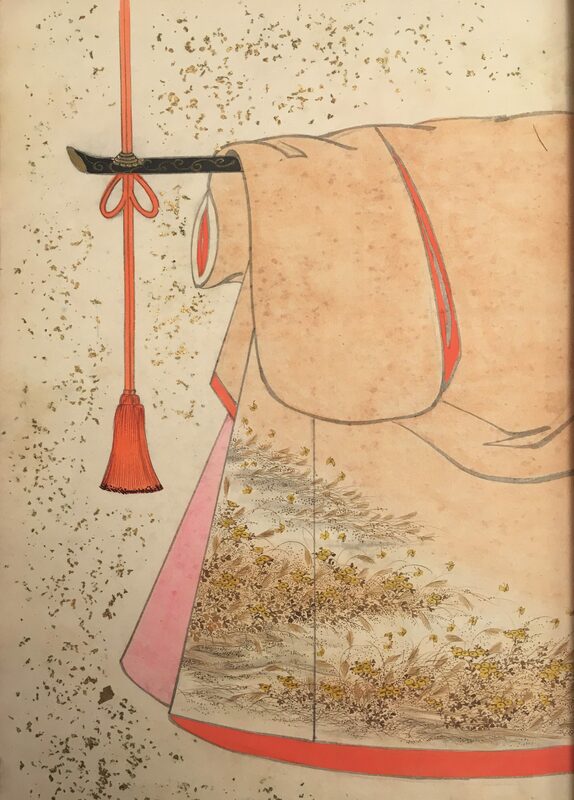 All tomesodes are generically alike (in their basic shape, their modest pattern placement); therefore, it is through the selection of colors and symbols that a woman reveals her taste. For example, this book includes several patterns with the same auspicious motifs such as pines and cranes, but arrayed in different designs. Likewise, contained in the book are several different patterns with similar seasonal botanical motifs. The variety of patterns attests to the varied tastes of prospective wearers. Auspicious motifs would communicate a wearer’s good wishes to onlookers, and seasonally-appropriate motifs would please them as well. Yet at the same time the ways in which the motifs are arranged in the design bespeak the wearer’s taste in fashion. 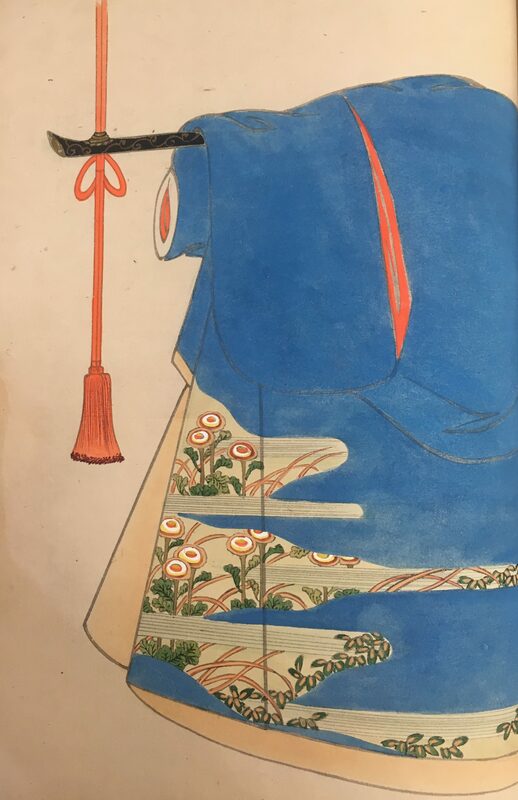 A kimono wearer would enjoy going through this kind of book, pondering which motifs might suit her style and how she might arrange them to create a look that would best represent her personhood. Boettcher, Cheryl. 1987. “The Kimono Imagined.” Occasional Papers (University of Illinois at Urbana-Champaign. Graduate School of Library Science), no. 180. 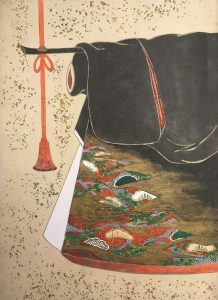 Maruyama, Nobuhiko 丸山伸彦. 2008. 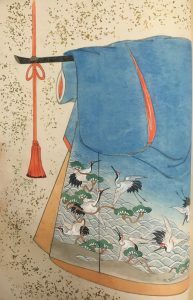 Edo mōdo no tanjō: mon’yō no ryūkō to sutā eshi 江戸モードの誕生: 文様の流行とスター絵師 [The birth of Edo fashion: pattern trends and celebrity designers]. 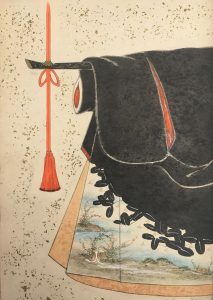 Tōkyō: Kadokawa Gakugei Shuppan. Mostow, Joshua S. 1996. 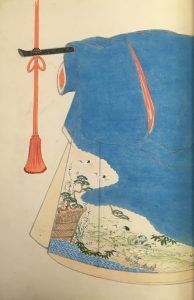 Pictures of the Heart: The Hyakunin Isshu in Word and Image. Honolulu: University of Hawaiʻi Press. Nagasaki, Iwao 長崎巌. 2002. 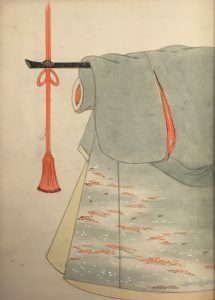 Kosode kara kimono e 小袖からきものへ [From kosode to kimono]. Nihon no bijutsu 日本の美術 [The art of Japan] no.435. Yokoya, Kenichirō. 2008. 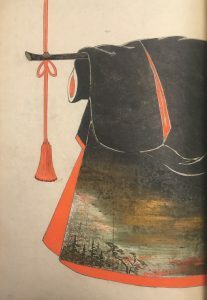 “Kimono Zuanchō in Kyoto.” Translated by Maya Hara. In Zuanchō in Kyoto: Textile Design Books for the Kimono Trade, edited by Becky Fischbach, 5–32. Stanford: Stanford University Libraries. 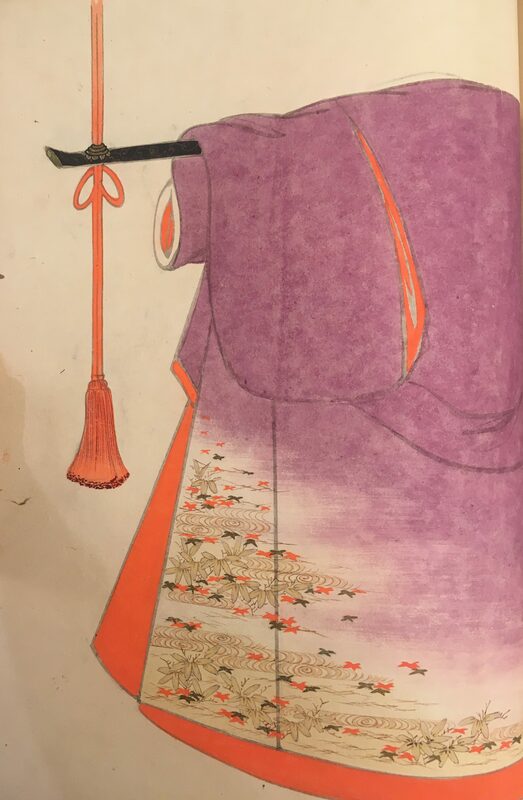 The author would like to thank Mizuho Kamo and Natsuko Takasu for their assistance in dating the item and in clarifying certain historical aspects of kimono pattern books. Ayako Yoshimura works as Japanese Studies Librarian at the University of Chicago Library. She earned a Ph.D. in folklore at the University of Wisconsin–Madison. 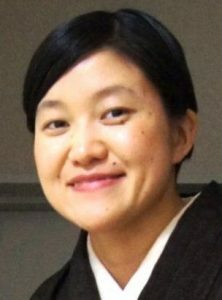 Her dissertation—entitled “An Autoethnography of Kin-aesthetics: Retrieving Family Folklore Through the Wearing of Used Kimonos” (2015)—investigated what it means for a contemporary Japanese woman to wear kimonos, especially inherited ones. 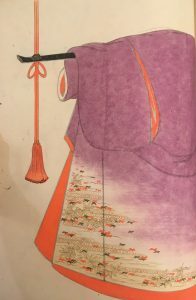 While continuing her kimono research, she offers university lectures and public talks on both folklore and kimono culture.